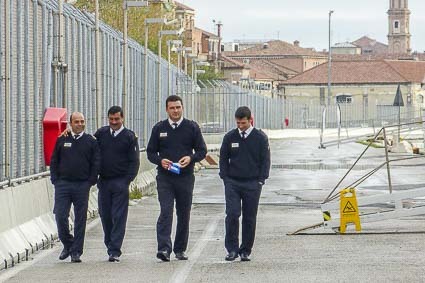 ABOVE: Uniworld River Countess officers stroll on Venice's Santa Maria pier after the season's final cruise. The company's official Web site has sections devoted to River Countess (including deck plans), the "Venice & Gems of Northern Italy" cruise itinerary, and the "Splendors of Northern Italy, Venice, Florence, and Rome" cruise tour. Our 10-page review is accompanied by a 33-page day-by-day photo diary of a seven-night roundtrip cruise on the Seine. PC Magazine has called our site "the premier visitors' site for Venice, Italy." The site has a large Venice for Cruisers section with advice on cruise terminals, hotels near the piers, and getting to the port. If you're in a hurry or using a smartphone, go to our QuickVenice site for succinct, mobile-friendly travel advice.